Last week Secretary of State Mike Pompeo ordered the last of the US diplomats out of Venezuela, saying their presence was a “constraint” on US policy toward the country. The wording seemed intended to convey the idea that the US is about to launch military action to place a Washington-backed, self-appointed politician to the presidency. Was it just bluster, designed to intimidate? Or is the Trump Administration really about to invade another country that has neither attacked nor threatened the United States? While US Administrations engaged in “regime change” have generally tried to mask their real intentions, this US-backed coup is remarkable for how honest its backers are being. Not long ago the National Security Advisor to the president, John Bolton, openly admitted that getting US companies in control of Venezuelan oil was the Administration’s intent. Trump Administration officials have gone so far as mocking the suffering of Venezuelans when a suspiciously-timed nationwide power failure heightened citizens’ misery. 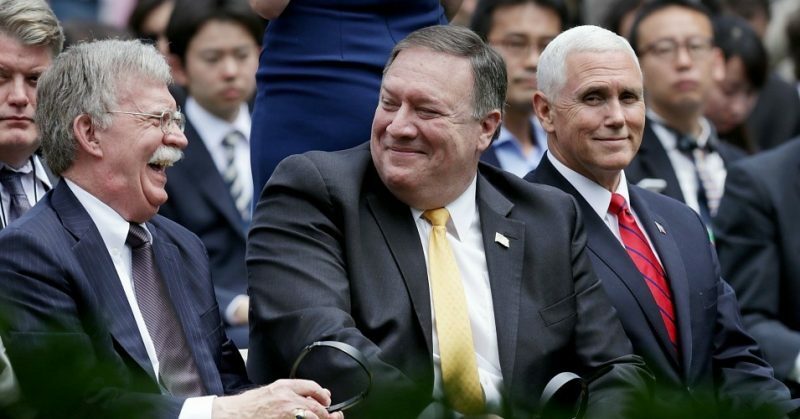 According to media reports, Vice President Mike Pence is angry with the Venezuela coup leader, Juan Guaido, because he promised the whole operation would be a cake walk – just like the neocons promised us about Iraq. Guaido said hundreds of thousands of protesters would follow him to the Colombian border to “liberate” US aid trucks just over the border, but no one showed up. So Pompeo and the neocons made up a lie that Venezuelan president Nicolas Maduro’s thugs burned the aid trucks to prevent the people from getting relief from their suffering. Even the pro-war New York Times finally admitted that the Administration was lying: it was opposition protesters who burned the trucks. Was the US behind the take-down of Venezuela’s power grid? It would not be the first time the CIA pulled such a move, and US officials are open about the US goal of making life as miserable as possible for average Venezuelans in hopes that they overthrow their government. Congress has to this point been strongly in favor of President Trump’s “regime change” policy for Venezuela. Sadly, even though our neocon foreign policy of interventionism has proven disastrous – from Iraq to Libya to Syria and elsewhere – both parties in Congress continue to act as if somehow this time they will get it right. I have news for them, they won’t. Even weak Congressional efforts to remind the president that Congress must approve military action overseas sound like war cries. In Rep. David N. Cicilline’s (D-RI) statement introducing his “Prohibiting Unauthorized Military Action in Venezuela Act” last week, he sounded more hawkish than John Bolton or Elliott Abrams! The statement makes all the arguments in favor of a US military attack on Venezuela and then – wink wink – reminds the president he needs authorization beforehand. As if that’s going to be a hard sell! So is President Trump about to attack Venezuela? At a recent US House hearing, one of the expert witnesses testified that such an invasion would require between 100,000 and 150,000 US troops, going up against maybe three times that number of Venezuelan troops in a country twice the size of Iraq. With a lot of jungle. All for a “prize” that has nothing to do with US security. If the president makes such a foolish move he might find the current war cheerleaders in the Democrat Party changing their tune rather quickly. Let’s hope Trump changes his tune and returns to his promises of no more regime change wars.